ALP is proud to present you the industry’s highly demanded Induction Cap Sealing equipment. With a huge experience of about four decades, we supply superior quality machines ensuring maximum satisfaction and reliability to our customers. 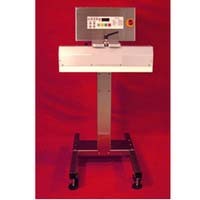 Advanced Liquid Packaging’s most renowned and demanded waterless induction sealer is The Unifoiler Series. Owing to the unparalleled devotion to quality products and engineering skills, we provide the highest level of performance with our induction sealing equipment. To those who question on the reason of designing waterless sealers: Waterless systems occupy half the space of the previously used water cooled system. This is because of the elimination of filters, hoses, pumps, radiators, flow switches, water and of course – all the garbage! Small number of parts imply less maintenance and changing parts, which is very smart actually. Item available now in stock!